The Create a Topic option has been removed. Available Work and My Work have been cleared out for Helium Publishing 360 work. Filters remain, but will have no results for those publishers. Completed Work now allows a filter to be created that is limited to a workflow stage. 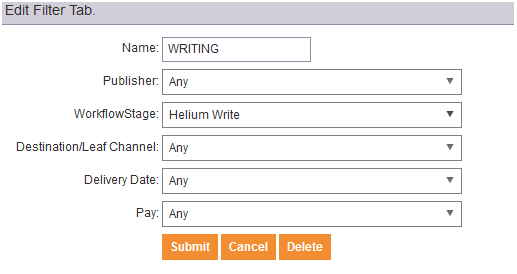 If you both edited and wrote for Helium Publishing 360 sites, you can create a filter to limit your writing work to make finding content easier. Complete directions for copying your written work from Completed Work can be found here. The Helium Publishing 360 menu has changed to only include Rates, Ranks and Views and the Microsite links. Although users will no longer be able to rate, any stars they have at the time of deployment will remain as long as the sites are up, and they will earn revenue share at the increased premium. Members will be able to download any content that is currently on a microsite and/or remove that content from the site from the Ranks, Rates and Views page. Content that could have been revised will be eligible to download or remove. You will need to press the Envelope button under the Download column. A file will be created named by the headline of the article. All formatting and HTML coding is retained in the Body section of the file. Any data like keywords and abstract are also included. Article images are not part of the download. Members wishing to keep their images should save them from the microsite before removing. The Download option works best using Wordpad, Textpad or Microsoft Word. Opening this with Notepad will make it look completely unformatted. Complete directions for downloading your content can be found here. If a member wishes to download their content, they must do so before removing. Members who have removed their content and therefore no longer see the option in the grid must locate any content from their Completed Work. They will have the ability to copy and paste from the Article Viewer. The second option here is Remove. If a user presses the X under the Remove column, they will be warned this cannot be undone. Successfully removed content will no longer appear on the microsite, nor in their public facing biography, nor in the Rates, Ranks and Views grid. Complete directions for removing your content can be found here. The Helium Publishing 360 microsites no longer have the Tools button.